A reference text focusing on basic organic chemistry and reactions of naturally occurring organic substances in soils. Covers pools of organic matter in soils, transformations, methods of extraction and fractionation. Section two deals primarily with the chemistry of known classes of organic compounds in soils including saccharides, lipids and constituents containing nitrogen, phosphorus and sulfur. Section three is concerned with basic organic chemistry of humic substances, followed by the importance of organic matter associations and interactions. Contains new chapters on NMR spectroscopy, analytical pyrolysis and on chemical structures. 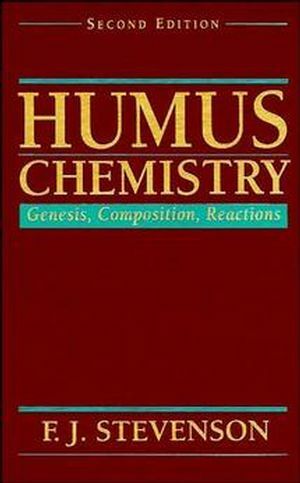 F. J. Stevenson is the author of Humus Chemistry: Genesis, Composition, Reactions, 2nd Edition, published by Wiley. Organic Matter in Soils: Pools, Distribution, Transformations, andFunction. Extraction, Fractionation, and General Chemical Composition of SoilOrganic Matter. Organic Forms of Soil Nitrogen. Native Fixed Ammonium and Chemical Reactions of Organic Matter withAmmonia and Nitrite. Organic Phosphorus and Sulfur Compounds. Biochemistry of the Formation of Humic Substances. Structural Components of Humic and Fulvic Acids as Revealed byDegradation Methods. Characterization of Soil Organic Matter by NMR Spectroscopy andAnalytical Pyrolysis. Structural Basis of Humic Substances. Colloidal Properties of Humic Substances. Electrochemical and Ion-Exchange Properties of HumicSubstances. Organic Matter Reactions Involving Pesticides in Soil.